Pamela Anderson Scores a Proposal: The Baywatch alum is rushing to marry French footballer Adil Ram this summer — because she wants to have his child! 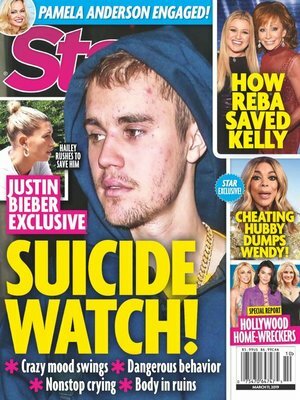 Justin Bieber: Suicide Watch! The lonely “Love Yourself” singer won’t take his own advice — and friends fear his erratic behavior is a cry for help. Plus: How wife Hailey is handling the pressure of dealing with a husband in despair. Kelly Clarkson’s Saving Grace: Reba McEntire! Star goes inside the strong bond between the American Idol star and the country singer.